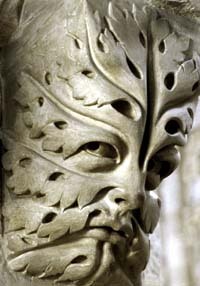 The roots of the Green Man lie in very ancient mythology, much of which is described by Anne Baring and Jules Cashford in "The Myth of the Goddess" and by William Anderson in "Green Man: Archetype of Our Oneness with Nature", and also in Frazer’s "The Golden Bough". The essential basis was a community that in considering its source, regarded the Earth as its Mother, starting thus with a feminine aspect to the divine power responsible for their presence. In the majority of very early communities the earliest images are female figurines, usually seemingly pregnant. The Goddess looked on her troubled people, and, without a male partner, gave birth to a son who was destined to be both divine and human, one who would have to die, but who was put among the people to help them. In many of the myths the son becomes associated with a tree, and this is seen as the image of a divine presence in nature. In the mythology the son grows up to become the consort, husband, and protector of the Goddess, but he still has to die, a sacrificial king, to be replaced in a fresh cycle of regeneration. This is acted out in many of the folk customs. The prevalence of this theme in mythology is both astonishing and enlightening, and, of course, it is represented also in the story of Christ, or, it may be said, the mythology foretells the coming of Christ.